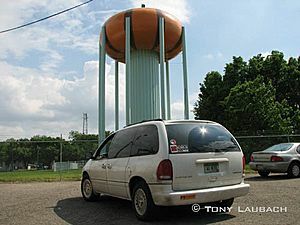 Not to be confused with Centerville, Ohio. Motto: "Home Of "The Pumpkin Show"
Noted frontier explorer Christopher Gist was the first recorded European visitor to the Circleville area. Gist reached Maguck, the small Lenape village of about 10 families on the east bank of the Scioto River, on January 20, 1751. He wrote that he had stayed in the town for four days. Dissatisfaction among residents rose over Circleville's layout, however. 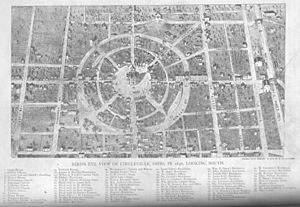 In 1837 at the request of the town, the Ohio General Assembly authorized the "Circleville Squaring Company" to convert the town plan into a squared grid, as was typical of other platted towns. In 1856, this had been completed in several phases. No traces of the original earthworks remain. A few of the older buildings have curved walls built to conform to the town's original circular layout. On October 13, 1999, an F-3 tornado hit the city, set off by a squall line moving through the region. The tornado touched down on the north side of town, doing substantial damage to a barber shop and a masonry building. A furniture store was also damaged with a hole in its roof, where it was reported that items from inside the store were sucked out. Damage to nearby buildings occurred as the tornado moved east across the north-central part of town. The tornado moved into a residential area in the Northwood Park neighborhood, destroying several homes along Fairlawn Drive. Trees and vehicles were also heavily damaged. The tornado lifted as it crossed Edgewood Drive, but snapped the tops of some nearby trees. 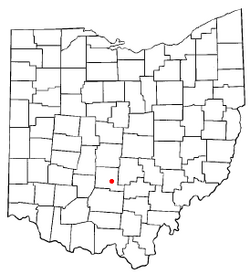 Circleville is located at (39.60, −82.95). Median home prices in the Circleville area as of 2009 were $120,147. As of the census of 2010, there were 13,314 people, 5,402 households, and 3,447 families residing in the city. 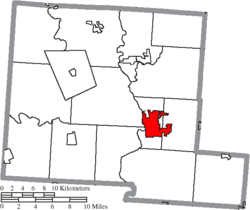 The population density was 2,005.1 inhabitants per square mile (774.2/km2). There were 6,024 housing units at an average density of 907.2 per square mile (350.3/km2). The racial makeup of the city was 95.4% White, 1.9% African American, 0.2% Native American, 0.4% Asian, 0.4% from other races, and 1.7% from two or more races. Hispanic or Latino of any race were 1.1% of the population. There were 5,402 households of which 30.3% had children under the age of 18 living with them, 44.2% were married couples living together, 14.5% had a female householder with no husband present, 5.1% had a male householder with no wife present, and 36.2% were non-families. 30.5% of all households were made up of individuals and 13.5% had someone living alone who was 65 years of age or older. The average household size was 2.36 and the average family size was 2.90. The median age in the city was 39.3 years. 23.3% of residents were under the age of 18; 8.9% were between the ages of 18 and 24; 24.8% were from 25 to 44; 25.4% were from 45 to 64; and 17.7% were 65 years of age or older. The gender makeup of the city was 47.9% male and 52.1% female. As of the census of 2000, there were 13,485 people, 5,378 households, and 3,581 families residing in the city. The population density was 2,037.2 people per square mile (786.5/km²). There were 5,706 housing units at an average density of 862.0 per square mile (332.8/km²). The racial makeup of the city was 95.36% White, 2.54% African American, 0.20% Native American, 0.49% Asian, 0.06% Pacific Islander, 0.27% from other races, and 1.08% from two or more races. Hispanic or Latino of any race were 0.82% of the population. There were 5,378 households out of which 31.1% had children under the age of 18 living with them, 49.8% were married couples living together, 12.7% had a female householder with no husband present, and 33.4% were non-families. 29.0% of all households were made up of individuals and 13.4% had someone living alone who was 65 years of age or older. The average household size was 2.40 and the average family size was 2.93. In the city the population was spread out with 26.7% under the age of 18, 8.6% from 18 to 24, 26.7% from 25 to 44, 22.0% from 45 to 64, and 16.1% who were 65 years of age or older. The median age was 36 years. For every 100 females there were 94.8 males. For every 100 females age 18 and over, there were 85.8 males. The median income for a household in the city was $34,572, and the median income for a family was $41,943. Males had a median income of $32,342 versus $26,115 for females. The per capita income for the city was $17,220. About 11.1% of families and 13.3% of the population were below the poverty line, including 21.4% of those under age 18 and 6.5% of those age 65 or over. Circleville 1810 was reference on Milo Murphy's Law on Disney XD, episode 6a "Family Vacation"
Circleville, Ohio Facts for Kids. Kiddle Encyclopedia.